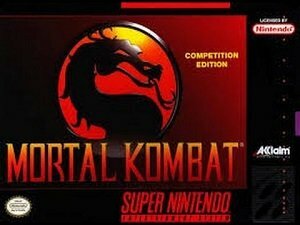 Cheats, Tips, Tricks, Walkthroughs and Secrets for Mortal Kombat on the Super Nintendo (SNES) We also have PRO Action replay and game genie codes. Fight as Goro – Successfully complete the game. When ‘The End’ message appears, quickly hold Up/Left + Select + A until the title screen appears. Press Start to began a new game. Glitch: Cool Looking Goro – To fight cool lokking Goro…(Silver-colored) Use Rayden. On endurance level 3, use his fatality on the last guy of the fight. (his fatality is forward,forward,back,back,back,Y). It should then eletricute the hell out of the guy. Then goro will appear silver-colored. Fight Reptile – In the Pit level, get a Double Flawless on your opponent and perform the Pit fatality. Reptile should then challenge you. Move players off the screen – Start a two player tournament battle with any of the fighters. Fight until one of the characters is one throw away from defeat. Allow the time run down until one second is remaining. Finish off the fighter with a throw (stand next to the opponent and press B). In the next round, either character may be moved off the edge of the screen. Johnny Cage Fatality – Stand next to your opponent and press Forward, Forward, Forward, Y. Johnny will kick through the opponent. Kano Fatality – Stand next to your opponent and press Back, Down, Forward, B. Kano will rip out his opponent’s heart. Liu Kang Fatality – Stand anywhere and hold Block, then rotate the D-pad in a full circle towards your opponent. Liu will do an uppercut. Raiden Fatality – Stand next to your opponent and press Forward, Forward, Back, Back, Back, Y. Raiden will electrocute the opponent. Sub-Zero Fatality – Stand four character spaces apart and press Forward, Down, Forward, Y. Sub-Zero will freeze the opponent and break him to pieces. If you are lucky enough to own an action replay you can use the below codes in Mortal Kombat snes cheats on the SNES. If any of the codes do not work, or if you know of any that do work that I did not mention please post about it in a comment below. If you are lucky enough to own a Game Genie you can use the below codes in Mortal Kombat snes cheats on the SNES. If any of the codes do not work, or if you know of any that do work that I did not mention please post about it in a comment below. 55C3-C01F All right, who cut the cheese? If you are playing Mortal Kombat on Snes9x (Or another SNES emulator which supports cheat codes) there are a ton of cheat codes you can use. You can basically use any of the codes listed under the Action replay codes + Game Genie Codes sections, you simply need to enter the required code as per below. Question : Can I use all of these Mortal Kombat snes cheats SNES Cheats? Answer : The cheats I have listed under “Normal Mortal Kombat cheats (SNES) Cheats” can be used by everyone. You will need a Action Replay or Game Genie to use the cheats listed on this page. Question : Do the Mortal Kombat snes cheats Cheat Codes Only Work In The Snes9x Emulator? Question : I know a good cheat for Mortal Kombat snes cheats that is no listed on this page, Can you add it. Question : Do you have any gameshark pro codes for Mortal Kombat snes cheats? I hope this article on Mortal Kombat Cheats + Action Replay / Game Genie Codes has helped you. If you are aware of any tips I have missed off please post about them in a comment below. Please help us out by spreading the word and sharing this article on Mortal Kombat snes cheats (SNES) Cheats + Action Replay below.